ABT Sportsline Audi S3 – a really impressive performance! Modifications of stock cars are usual these days. Majority of them are just about exterior changes and sometimes someone can’t see any limits. So results are often terrible – more plastic parts than original ones&#61514;. But we’re used to see also very nice show cars and unique tuning cars. Another situation is in the case of just performance tuning of engine parts. The new can prove real characters of pure sporting improvements. Today’s representative is made by ABT Sportsline from Germany and their modified Audi S3. Maybe every car manufacturer has own sporting model based on some stock model. Audi, a car manufacturer from Germany, has also one representative – a good looking car with great parameters. 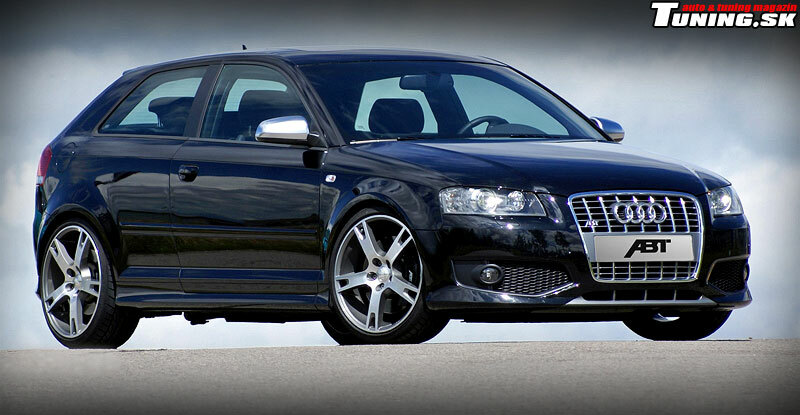 Audi S3 is a compact and stylish vehicle and the most powerful product from the A3 product line.S3. The S3 is a new member of Audi’s sporting family and it can easily handle today’s demanding automotive market full of thirsty enthusiasts. It looks great as the stock A3, but it has also more aggressive look (sporting sills, bumpers, chrome parts etc.) and high-output aggregate. Generally, this sporting car is suitable also for the most demanding customer. The S3 model offers especially one great part – the engine of course. Everybody knows that Audi is an expert and knows how to take care about direct injection systems as FSI in sporting modifications. The S3 owns a 2.0 liter in-line 4-cylinder engine cooperating with a turbo and electronic engine management. Just 2 liters of displacement can produce amazing 265 hp (195 kW) at 6000 rpm and nice 350 Nm of torque available from 2500 rpm. These values are enough to shoot these 1455 kilograms to 100kmph in just 5.7 seconds. ABT Sportsline is a well known company. It’s focused on VW group brands such as Volkswagen, Skoda, Seat and Audi. Their effort results into well tuned machines with great power under their hoods. The newest mission of the company is to improve the great power of the S3. Don’t expect any styling changes, don’t wait. ABT Sportsline makes just performance tuning on this model. It’s delicious for any tuner to tune petrol turbo engines with direct injection systems. So ABT takes the primary tuning step in this case – a chip-tuning. Slight changes bring additional 45 hp to final 310 hp. Torque is also bigger – new 70 Nm increase the total value to 420 Nm and this means more push to the seat. ABT’s S3 can reach 100kmph in 5.3 seconds and that’s quite good. It has also new exhaust tip producing typical ABT scream. Christian Abt, one of the best DTM racers, designed its suspension to provide best possible handling and stability. The car stands on new five-spoke ABT rims from AR series (8,5x19 ET50). Your opinion on Audi S3 from ABT ?